Transport and storage of materials – Moisture damage can occur on uninstalled porous materials like wallboard, and impact equipment such as air handlers and ducts awaiting installation. If not protected, air handling equipment can also be impacted after installation. It is important for your project team to inspect materials when they arrive at the site to ensure that they are in acceptable condition from a water-damage and mold perspective. After the building is made “tight” – Although roof and curtain wall systems are in place, there are often many penetrations required to move materials into the building or in limited incomplete locations where moisture can enter. At the same time, water-sensitive materials are beginning to go up. During processes that require the use of water – Many product installation processes that use water continue well into the construction project. Pressure testing of plumbing lines can also pose significant challenges. There are many common construction processes that involve water including two we frequently encounter that require close attention. The first is the use of tile saws, a water-intensive process that often occurs after porous materials have already been installed. 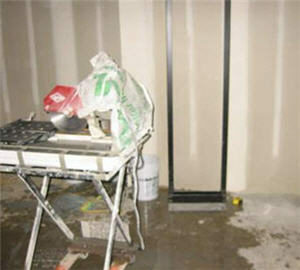 We frequently see puddles surrounding the saws that come in contact with wallboard, and they even leak to lower floors. The second process of concern is concrete coring when the contractor’s focus is often on preventing damage and injuries from falling materials below the activity. While safety is the primary concern, there also needs to be attention paid to the impacts on porous materials from the water used during this process. There was a case in which concrete coring was being performed in a high-rise to connect a series of data closets located directly above each other on each floor. During one of our periodic project inspections, we identified moisture damage on the first floor, and followed the path of moisture damage up successive floors to the fifth floor where the coring was being performed on that day. The water used in the process was soaking the finished wallboard in the data closets below on every floor. By the time moisture damage was noticed on the first floor, it had already impacted the 3-4 floors above. Fortunately, in this case the problem was identified before it progressed even farther, and we were able to dry the materials in place without the need to replace them. This speaks to the value of contractors being aware of moisture issues and responding quickly when they’re noticed. When wet materials can be dried instead of replaced, it saves a great deal of time and expense. To proactively manage risks, you may consider developing specific plans for water-intensive processes that define proper procedures and conduct site inspections to verify compliance with the plan. Once porous materials or water-sensitive equipment begins to be installed in the building, attention needs to be paid to the potential for water damage on every project. I mentioned before that one of the critical periods is just after the building is “tight” but when a number of openings to the outdoors are still present. This 3 to 4-month (or more) period introduces the potential for water and moisture damage on virtually every project. It is especially critical to be vigilant in managing risks of water damage during this time. The most effective preventive measure is the development of a mold and moisture management plan for the project. This plan primarily serves to inform the contractor and any subcontractors of the potential issues and the common activities that cause them. It also puts in place a management system that includes items such as periodic inspections and an action plan to deal with moisture damage quickly and appropriately in order to minimize the impact to materials and prevent the need to replace them. The key to preventing mold growth and water damage to materials is moisture control, and this plan serves as the foundation for that control. Integrating a moisture awareness and prevention program into the construction process in not a burdensome process and it can actually save labor, time and money in the long-run. It simply becomes routine for contractors and subcontractors to look for potential issues and notify someone as soon as they see them. Inspections are being performed regularly during these projects to ensure that work is being completed as specified, so adding a moisture awareness component doesn’t place any additional burden on the project. The actual time spent drying materials is minimal compared to the time required to rip out and replace materials (or equipment) if the damage is not identified or is ignored. If this damage is buried behind walls or in ceilings, the potential exists for it to cause any number of indoor air quality problems after occupancy and then the costs to remediate escalate rapidly, not to mention potential liabilities and warranty issues. If you need guidance on developing a plan to manage mold and moisture for your construction project, contact us today!